Clearly children are a cost on a household economy but my statement goes beyond that. What most people don't appreciate is how the government measures household income and the effect the presence of children has on the result. It's the application of a formula to adjust income for the number of household members. "The first row of figures identifies the family or household type: (1,2) is a one adult, two child household, and so on. The second row gives the values of the equivalence ratios used. 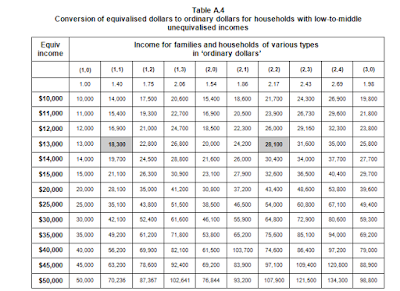 The body of the table indicates, for example, that a (2,2) household needs around $28,000 to have the same purchasing power as a (1,1) household with an income of around $18,000. Each has an equivalised income of $13,000 (or, to put it another way, each household has an income of $13,000 per equivalent adult). " The way child poverty is measured is derived from the median equivalised household income. 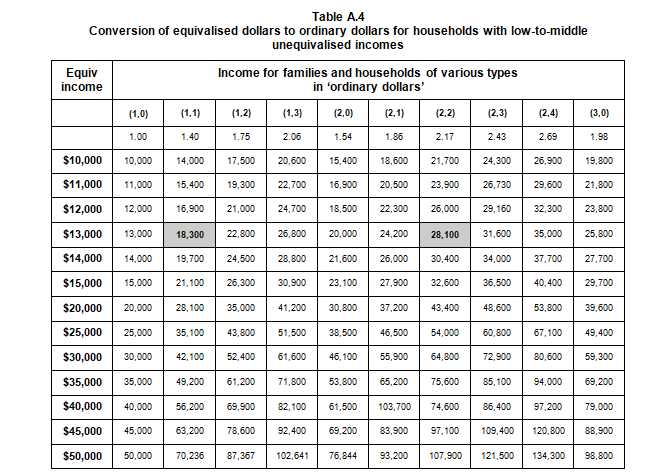 So from the example a 2 adult, 2 children household has their income more than halved before it is entered into the calculation. So we have this crazy conundrum. The mere fact of having children drives households into 'poverty'. Or the way poverty is measured creates a greater problem than might otherwise present.